You are here: Home / Archives for Liam! 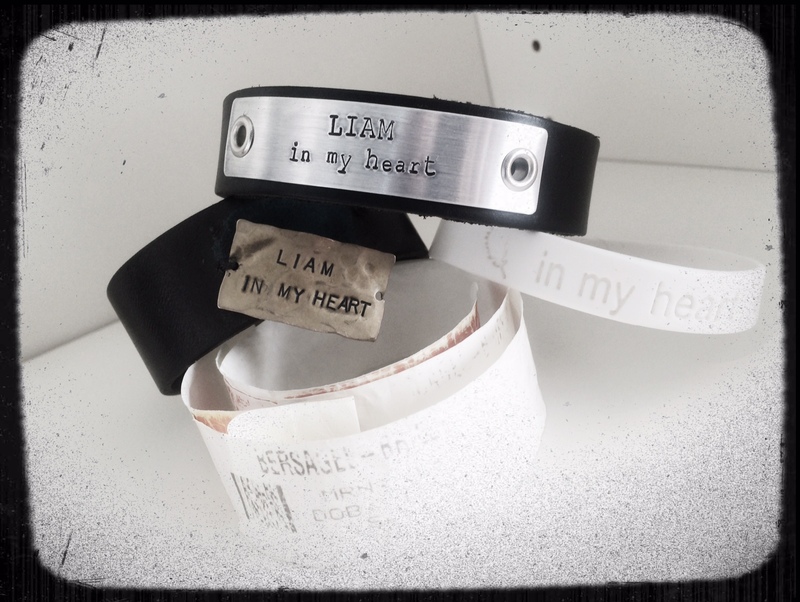 The night that we were admitted to the hospital with Liam, a wristband was placed on my right wrist identifying me as his Father. This physical symbol has been an important connection for me for the entire time since, and for moments – no matter how short they have been – to be without is is like missing something big. Some version of the wristband has lived on that right wrist ever since Dec 19, 2010, and recently I had to seek out it’s fourth incarnation due to the constant wear. I did a bunch of research on-line (mostly through Etsy), and found something that was similar, yet vastly different that the previous one. It arrived in the mail today, and when I opened it, to my surprise, I was perhaps more excited to see the note accompanying the band than I was the band itself. 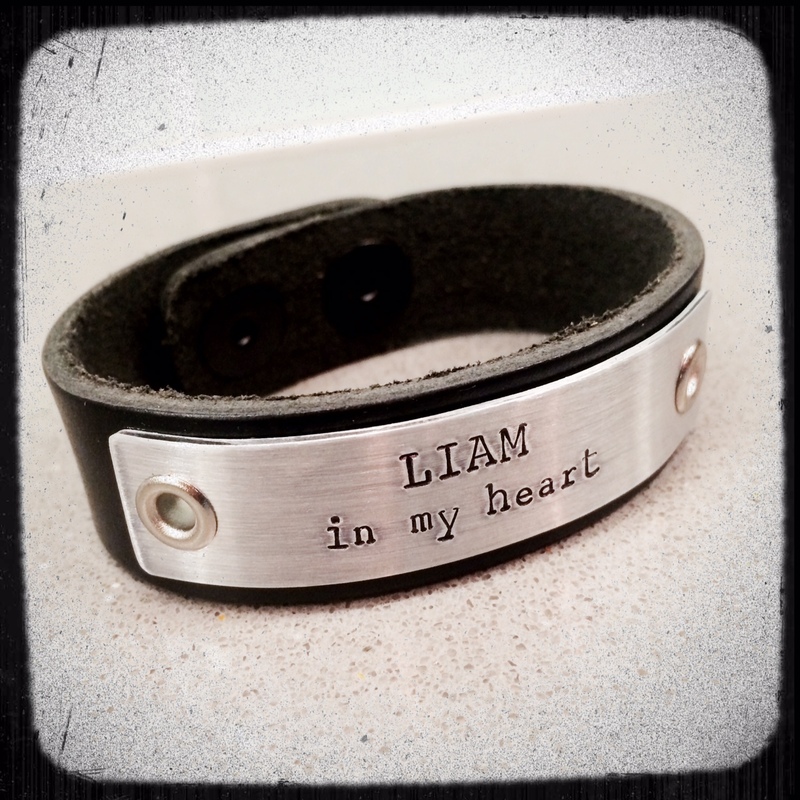 The note was a handwritten thank you from the artist who made it, and it said “I hope you love this & it makes you think of Liam.” Anytime that I hear his name – as referenced to him, not someone else also named the same – it brings a great warmth…I am so appreciative for the note, for the band, and for the connection that this maintains. And because she made something so beautiful to accompany the band, I would like to throw a shout out to Summer at Dakota Designs Jewelry…make sure to check her stuff out. Tomorrow is supposed to be Liam’s third birthday. Alas, it is actually a day that has this off combination of current reality and memory, and a day where all of the emotion doesn’t have a place to release. Last year we asked a favor of you, and within that favor we looked for ways to cope with the absence. And you delivered it to us in ways that we couldn’t have imagined. So guess what…we are asking again. I’m not sure if this is going to turn into the same request each year – there might be a slight modifier in the future – but so far, this request hasn’t jumped the shark. It’s still relevant, and there is still much that can be done. So as a reminder of what we asked last year (or if you are new on this journey with us), we are asking that you go out and do something nice for someone else. The recipient can be a family member, a friend, a coworker, or a complete stranger. All that we ask is that you expect nothing in return, and that whatever you choose to do will have positive outcomes in a way that would be appropriate for celebrating Liam (it doesn’t have to be for a kid or kid-centric, but you know what we mean). You can do it tomorrow, or within a few days…but please don’t delay: keep your act of amazingness relative to the inspiration. Give someone the gift of a free coffee or meal, pass along something that you don’t need anymore to someone that does need it, give your employees some extra family time, donate, or find your own way to give. You will know what you need to do when you look for it…and if something smacks you in the face, don’t ignore it because it’s hard or it’s something that isn’t easy. It would be an honor if you remembered Liam and celebrated him with us in this fashion. Let us know (if you want) by posting either here or on Facebook what you did: it will allow a geography dissecting celebration of Liam possible. Rewind: What Is There To Say? Elia was just a few months old when this picture was taken – around five months – and noticed the iPad for the first time. A beautifully written poem by a great friend that has also lost like we have. I was recently contacted by the Now I Lay Me Down To Sleep organization about writing a piece on Father’s Day for their newsletter…below is what I came up with. It’s hard when people forget to tell you “Happy Father’s Day!” because they don’t see the child that you have. It’s hard to watch and hear other people tell stories about how they get to go do something special with their kids on Father’s Day, and we have to go to a cemetery (or memorial spot) to spend the day together. But the truth doesn’t lie with everyone else. This is the third Father’s Day that I spend as a grieving parent. I was not supposed to know what it felt like to spend three Father’s Days as a grieving parent. Father’s Day celebrations that I had dreamed about did not look like this. But here I find myself, like all of you, grappling with the idea that I am a father without one of my children. 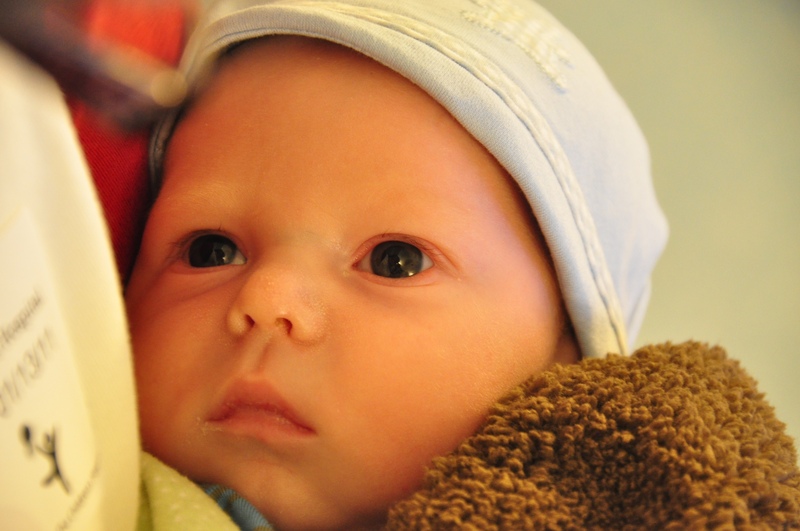 Two days shy of being two months old, our son Liam, died in February of 2011. As June rolled around a few months later, the thought of a “Father’s Day celebration” seemed like an idea that was far away from what my emotions could handle. Even saying the words created a pit in my stomach. I actually tried to mentally prepare myself for the day, but as you all know, no amount of ‘preparation’ actually compared to how the day presented itself. June 19, 2011 was an emotional roller coaster that lasted all day long. It was worse than I thought it would be. As parents, and as fathers, our expectation is that we will work tirelessly to provide for our families. We will do whatever it takes to care for them, and that we will exist in concert with our spouses to ensure that every opportunity is given to them. We cherish that we will laugh, hug, and buy ice cream. We support, and mentor our children; and under no circumstances will we let anything bad happen to them. This is what Father’s Day celebrates. It has nothing to do with the legal fact that you conceived a child; rather that you are that child’s loving and caring parent. And when it is all taken away from you, it’s difficult to cope with what the day actually means. The truth is that we may not have been able to take our kids out for an ice cream; but we have shown them in our time together that we love, care, and cherish them. However that time was spent for however long or short it was. We are reminded of this through the pain and the exhaustive loss that is felt every day, especially on Father’s Day. I wish that I could tell you that it has gotten easier over the last two years, and that entering the third time around, I have been able to focus only on the ‘love, love, love.’ But that would be a lie. The day has not gotten easier. The celebration has lost almost all of its luster. Sometimes on Father’s Day I feel ashamed, sometimes I do feel love, and sometimes I feel satisfied; but I always feel incomplete.This year, I am committing to doing one thing: smile more. I will look at the amazing pictures that I have of Liam and me, I will say his name, and I will try to remember that Father’s Day 2013 is celebrating the time that I had with Liam, not the time that I have been without. Last week we tossed out the idea and asked if you would help us remember Liam by doing an act of kindness in your part of the world….and honestly, we really didn’t quite know what sort of response to expect. I can tell you that even though we know that we are surrounded by a community of amazing people, I don’t think that either of us expected the outpouring that you gave to us, to Liam, and to others. As every single example was shared with us, we battled through tears to just finish reading the sentence. It was a stunning example of love and remembrance – and I’m not sure that we could ever thank you for that. 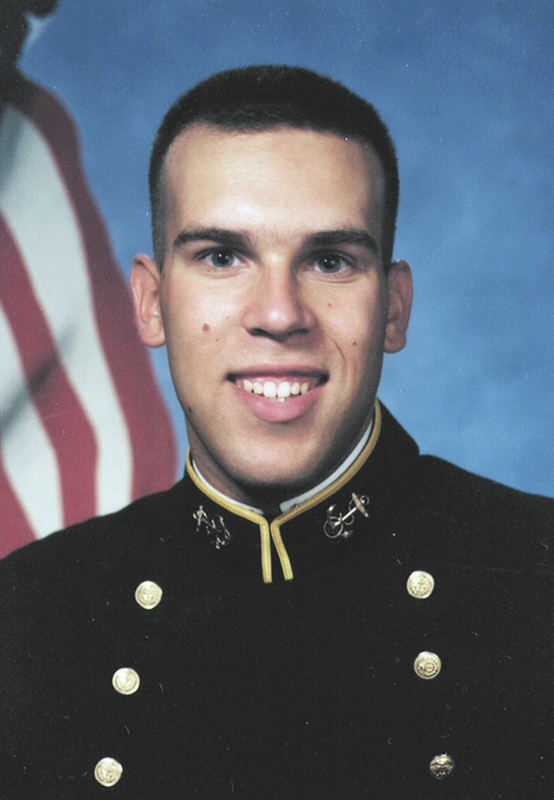 During a day that was difficult for us, these stories were very uplifting. There isn’t a good way to get a hard statistical breakdown on how many things were done, but I can tell you that literally from California and Washington to Massachusetts and Virginia, from Montana and Minnesota to Texas and Florida….and everywhere in between….we received stories of people doing things for others, donating time or money to amazing causes, giving of themselves to honor Liam, and introducing Liam and his story to new people. For now, we wanted to compile and share some of the stories that we received (we also know that the names below represent entire families). We know that many other acts occurred, and we thank all of you for your kindness. A friend from high school (Carin) left this note for someone random, and introduced Liam to someone for the first time. A brother from South Metro Fire sent this photo from his class at the National Fire Academy in Maryland. It has folks from all over the country – also meeting Liam for the first time. Scarves made for some students in South Dakota by the Smith family. December 19 is just two days away, and as we have thought about ways to celebrate Liam’s second birthday, a thought kept coming back into our minds. We had first heard about it a while ago (likely in the Parent’s Group), and loved the idea immediately. While we are going to remember and celebrate in our own way, this would allow each of you to remember Liam and celebrate him along with us. Since there isn’t a need for toys, books, or games; we are asking that on December 19 (or as close to it as possible) you go out and do something nice for someone else. Our restrictions on activities are almost non-existent, with the only two conditions being: 1) you expect nothing in return, and 2) it will positively effect the recipient in a way that would be appropriate for celebrating Liam (doesn’t have to be for a child, but you understand the point). Buy someone a meal, give something you don’t need to someone who does, help someone shovel their driveway, donate money, give, give, give, and give. You’ll know what it is when you look for it. We would be honored if you remembered Liam and celebrated him with us on Wednesday. Let us know by posting either here or on Facebook what you did – it will inspire us and make us smile through our connectivity. Eh, the top got cropped for some reason and I don’t feel like changing it. Deal. It’s a good series. Filed Under: Elia!, Ezra!, Liam! It’s one of the most innocent and well intentioned statements, and it flows off of the tongue so naturally in conversation that it’s annoying. It normally follows some statement of how easy or difficult things were during an experience with Erza, and it always comes from someone who already has more than one child. I know where it derives, and I understand why it’s said. Yet, it hurts every time I hear it. We’ve said it before, we honestly don’t expect people to always have Liam in their minds, but somewhere deep inside, that is exactly what we expect….because he is always there with us. Liam’s life was – for most people – a long time ago (I don’t mean that disparagingly, but in the realm of life, a year+ is a long time), but for us it was like yesterday; and as emotion ramps up around the arrival of a baby girl, the feelings and thoughts of Liam are right back on top. It’s a weird place to be: we have asked people to be ‘normal’ with us, and we don’t always want a sad conversation; but at the same time, we want people to remember Liam, and remember that we are still living with his memory. Let me explain something: we already have two children. This baby girl will be our third. It’s simple math, but it is so often avoided just to stop from putting someone else in a tight spot. It’s easier for most people to think and to say that we have one child. But the fact is that we are parents to two children….Ezra and Liam….and now a third girl is set to join the mix. My instant reaction when someone says that statement is to throw down with some rant about how I would love to have two at home already, and how dare someone forget Liam, and how I would trade all of the difficulty in the world in loading two kids into a car for the difficulty in dealing with loosing a child. It’s just not comparable. But, we don’t. We nod our heads, and gently remind that we have two kids….or sometimes ignore it all together. At times, it’s so hard not to scream – so here is the blog posting set to scream it for us. We are ready to embark on the joys of having a girl at home with the three of us. There is no hesitation on how hard, tiring, or trying it’s going to be. But we have been through something that will make us appreciate every single diaper change and every single night awake. Just wait till we have to deal with three kids.